"Every year hundreds of thousands of people get sick IN hospitals. Now there is a solution." Hospital Bed Tents designed to be used on every bed in your facility. diseases and filters out most airborne particles. ALSO: Electronic and sensitive equipment protection capsules. These capsules are extremely important for sensitive modern equipment. Bubble Bunkers to protect electronic equipment including computers, communication and guidance systems from smoke and other hazards. Click here for Low cost civilian version and custom sizes. The primary advantage of Bubble Bunkers include low cost, extremely effective emergency short term shelter, effective protection from the elements, high degree of bacteriological and element filtration. 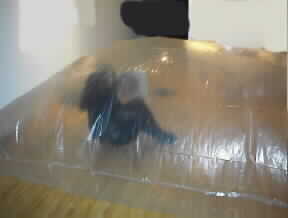 A 10x15 foot (3.3 x 5 meter) Bubble Bunker weighs only 18lbs/7kg and takes 5 to 7 minutes to set up. Bubble Bunker positive pressure chambers can be manufactured to order to almost any size and multiple functions. In the case show above, the Bubble Bunker (10 feet x 12 feet with 7 foot head room (3.1 meters x 4 meters with 2.3 meter head room) is coated with an "anti-radiation" coating which contains a thin film of boron which tests have shown reduces certain low level radiation by 80%. Other Bubble Bunkers are designed for extreme temperatures, including extreme heat and extreme cold. Filtering H5N1, H5N2 Avian Flu/Bird Flu and SARS (Severe Acute Respiratory Syndrome) virus from the hospital and work environment:. Can be also be used in non-field locations such as barracks, garages, office buildings, or other traditionally protected areas. 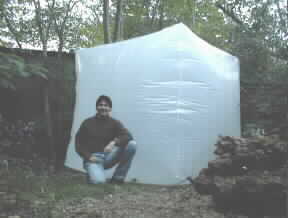 Much quicker to set up then a former conventional tent. Ultra light weight using modern materials. Available as either a positive or negative pressure isolation chamber. The Bubble Bunker® Hospital Bed Tents is an important milestone in patient care. Bubble Bunker Hospital Tents acts as a filtered isolation room around each and every bed in a hospital. 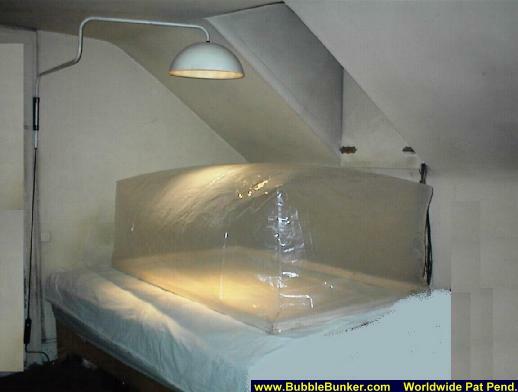 The cost to install the Bubble Bunker Hospital Bed Tent is low per unit and can potentially reduce the chance of a patient from contracting a foreign diseases. 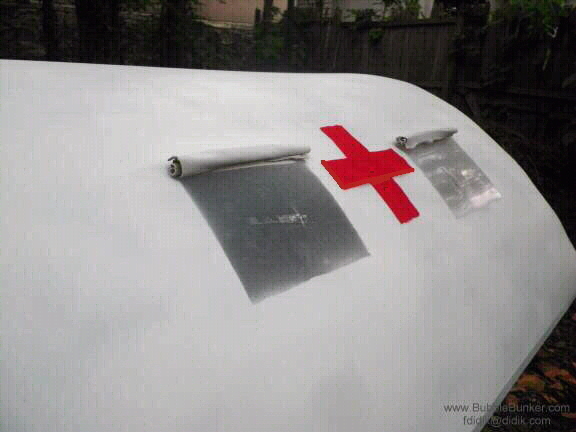 Not to have Bubble Bunker Hospital Tents can potentially increase a hospitals exposure to mal-practice suits. 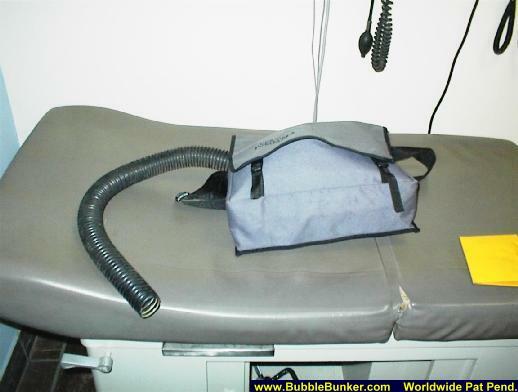 Different versions of the Bubble Bunker's® for medical are available as either a positive pressure isolation chamber or a negative pressure isolation chamber designed to either protect the patient within the chamber or protect others outside of the chamber from an infectious patient. 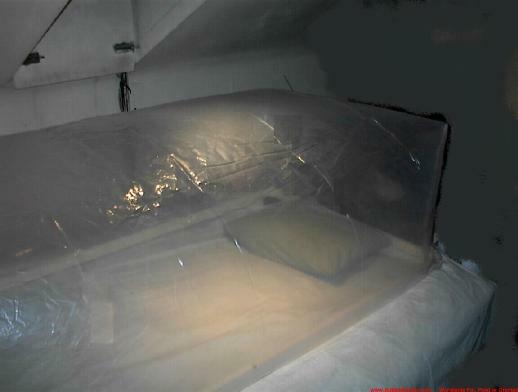 The BubbleBunker® contains a true HEPA filtration system which is capable of minimizing or eliminating many, if not most airborne particulates and hazards. This product is essential in a hospital environment. Special Bubble Bunkers® are also available to protect sensitive electronic, communication and computer equipment against dust, airborne particles and other equipment destroying contaminants. Please contact us about our range of such products. NOTICE: Not available until formal government approval. 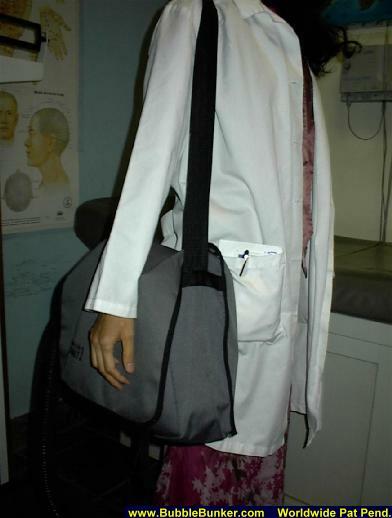 including for use in hospitals, the military and for home use. HEPA filters, which were originally developed by the Atomic Energy Commission in 1943, filter particles as small as .3 microns and are 97.97% efficient. Anthrax spores are larger than .5 microns. Viruses are not filtered by HEPA filters, since viruses are much smaller than what is possible to filter. It should be noted that a HEPA filter does not kill the organism, but rather, it traps the organism within the filter. It is possible for the organism to break free at some future time. For this reason, it is important for the user to wear protective clothing and/or gloves when changing filters. We have developed a series of BubbleBunkers with the purpose of protecting sensitive field electronic, communication and computer equipment to protect against smoke, and other airborne hazards. Bubble Bunkers for equipment are a must for all military equipment in adverse environments. Please contact us for further information and to describe your needs. Custom sizes up to the size of an aircraft hanger possible. Contact us about your needs. 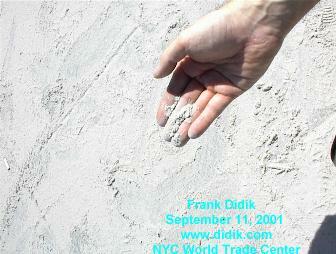 Immediately after the collapse, the entire city was blanketed with dust fallout that ranged in thickness from a thin film, to several inches thick. This dust was later determined to be a low grade health hazard containing a variety of materials including asbestos. Above photographs taken September 11, 2001 about 30 minutes after WTC1 went down. 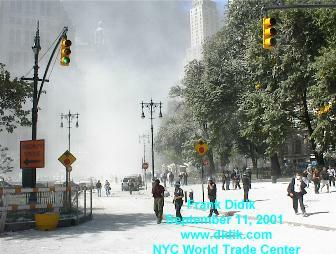 Shot in front of City Hall, 3 blocks from ground zero. Please note that Bubble Bunker's® are designed to assist the user in critical situations. The buyer/user agrees to assume all liability in the use of Bubble Bunkers®. Bubble Bunkers are designed for short term use only. Observe all safety precautions. Please note that due to the nature of the situation and for legal purposes, we do not make any claim of fitness for a particular purpose and do not offer any guaranty, written, expressed or implied, other than replacement of product if product is damaged.